Step 1. Pick your pumpkin. This could take hours of agonizing- weighing the pros and cons of size, shape, color, stem durability- or it could take 5 minutes. Step 2. 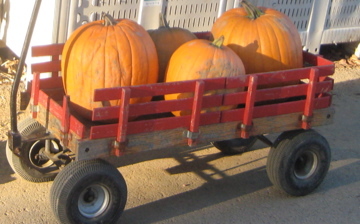 Pay for your pumpkins. Step 3. Clean your pumpkins. 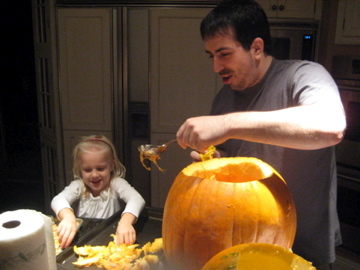 This is the hardest and most annoying part, though it does yield pumpkin seeds. If you happen to run across a small blonde urchin that can help you with this step, all the better. Step 4. LEMON-IZE it! 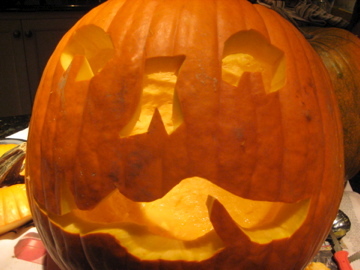 Once your pumpkin is carved, employ the same method you would with apple slices or any fruit that browns easily. 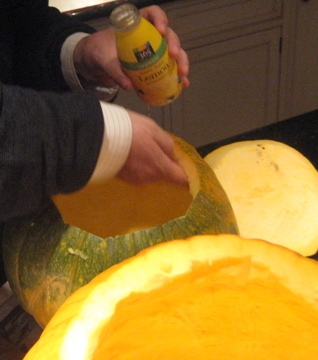 Coat the inside with a layer of lemon juice to help your pumpkin last longer. Step 5. Carving! Again, this could take hours of finesse, or minutes with a butcher knife. Your choice. Step 6. 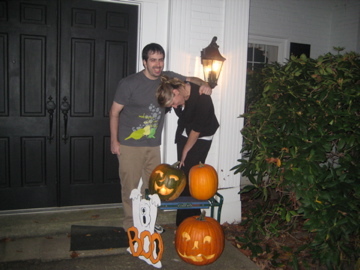 Endure millions of photo opportunities brought on by your amazing pumpkins. This was not the best photo, but it definitely captured the moment. How does a cute, smart, cuddly, blonde 5 3/4 year-old girl turn into a blonde “urchin” so quickly? Now the curly-haired candy corn thief, that is an urchin! Great blog & great photos!